Back pain is such a common ailment that affects many of us at some point in our life. Do you ignore it and just let it fade away when you first have a mild onset of back pain? or would you try to find out the reason and wish to prevent it happening again? Lower back pain could be caused by a number of factors. The common causes of lower back pain in middle-aged and young people includes weak abdominal and back muscles, obesity, inactivity, poor posture, sitting for extended periods at work stations, the wrong random movement, or muscle strain resulting from strenuous physical activity. Meanwhile, backache in the elderly is typically caused by age-related degeneration of the intervertebral discs in the spine. It is unfortunate if the back problems become chronic and it will cause some inconvenience in daily life. Despite knowing the design of our musculoskeletal structure is not ideal for sitting all day and night, many of us are still sitting daily either working, studying, commuting, eating, or chilling out. Sounds like your average daily routine, isn’t it? Combining with poor posture and lack of regular exercises, these repetitive sitting activities can cause massive compression on your spine, create weak glutes and tight hip flexors. 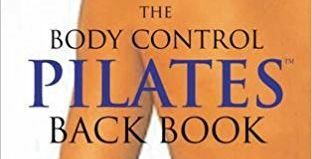 To understanding your back and learn how to prevent back pain, I would highly recommend this book “The Body Control Pilates Back Book”. This book is a comprehensive self-help manual focusing on back pain prevention and management using the unique Pilates body conditioning system. Pilates has a strong reputation in tackling back problems and many doctors, osteopaths and physiotherapists are already endorsing its unique quality to exercise deeply but gently, as well as to rebalance the posture. In addition, Pilates can strengthen your back and other supporting muscles so that the spine doesn't take all the strain and pressure. As a one-stop reference guide, this book explains how the back works, why backache occurs, the different types of back pain, when to seek professional help, lifestyle tips for prevention and exercises to promote flexibility and hold the correct posture. For those already suffering from back pain, check out the special remedial program of exercises, which is designed to restore mobility. With the well-explained exercises and the expertise of Paul Massey, Chief Physiotherapist to Britain's Olympic Swimming team, leading Pilates practitioner Lynne Robinson can help you bypass or overcome this most common of agonies. Remember though, it is always wise to consult a doctor before taking up any rehabilitation exercise program if you are suffering from back pain and it is advisable to practice these movements under supervision by a qualified Therapists or Pilates instructor. Click to check it out the Body Control Pilates Back Book.